We are one of the leading manufacturer and exporter of Mineral Ore Beneficiation Plant & Machines, fabricated from superior quality of raw materials. These plants & machines, specially designed for highest pressure performance, and are used in an assortment of applications. Some of the features of these plants and machines are precision functionality, optimum performance oriented and application specific design. Known for its durability and long service life, these are made in our state of the art production unit with all international specifications. Extensive process plant experience covering the full range of recovery techniques and unit processes from ore beneficiation to final product. Customized designs for multiple lower grade ores, ore types. Optimum performance oriented and application specific design. KINC’s IOBP plant for iron ore beneficiation is milestone in a journey of excellence .Capable to execute beneficiation plant on EPC, concept to commissioning basis with vast experience of working on various ores. KINC with in-house facility to design, manufacture main equipment required for washing circuits, flotation, screening circuits and vendors delivers assured technology in time. 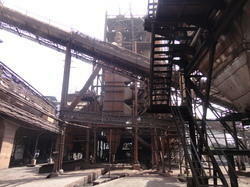 Looking for Industrial Mineral Processing Plant ?